All You Need Is Loot! Nothing says "I really LIKE-like you" like the gift of Munchkin. 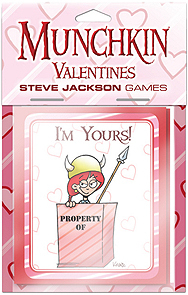 Each pack of Munchkin Valentines contains four new Munchkin cards plus a brief explanation of the game. We've also included five valentines (with envelopes!) so you can tailor your message of Munchkin affection to each recipient.